The latest generation to reach adulthood has often been criticized for being lazy, selfish and, in general, lacking any sense of a moral compass. Many of the critics turn to our country’s straying from Christian principles as the cause for this, and that very well may be the case. But it goes much deeper than that. It seems that when critics of Christianity worked valiantly to eradicate all traces of the religion that led our country to be a global super power from public schools, workplaces, and government offices, they inadvertently removed all morality along with it. And it appears that morality actually plays a role beyond the confines of church. The New York Times recently ran an Op-Ed titled, The Mental Virtues, where author, David Brooks, lays out the moral values necessary to be a person of character in boring old workplaces across the country: love of learning, courage, firmness, humility, autonomy, and generosity. According to Brooks these characteristics are what separate the everyday heroes from the schlumps who think they don’t matter and their choices don’t matter either. As the article points out heroes aren’t just soldiers on the battle field, but can be anyone who possesses the values and actions of a hero. Intellectual virtues are attainable and needed in every school, office building and government complex. This ‘moral enterprise’ sounds eerily like Biblical morality. Wouldn’t it be amazing if practical morality was once again taught to children in school? Wouldn’t it change the game if employers and teachers measured success based on one’s character and morality rather than their performance record? While Brooks is definitely on to something with his identified moral values, unless they are coupled with the underlying beliefs of Christianity they are not only unattainable, but they become a rigid measuring stick in which no one can ever be good enough. In fact, that sentiment is precisely what led to morality being tossed out the window over the last century. When Christ and grace and mercy were pushed to the back and the rules of Christianity became the focus, their appeal lessoned, leading to the mess we are in now. The education establishment in the United States—from K-12 to higher education—is in serious trouble on many fronts. Students are graduating high school with scant job prospects, ill-prepared for the demands of the workforce. Even worse, college students are graduating with 6-figures of non-dischargeable student loan debt and little connection between their education and the demands of the workforce. Except for some STEM (Science, Technology, Engineering, Math)-based fields, the costs of a college degree are fast-becoming out of touch with the benefits. If the problems stopped here, it would be bad enough. Now, we have even more bad news: not only are workers not technically-qualified for many of the good jobs, they are lacking basic common-sense skills: communication, basic professionalism, even team orientation. This is reflective not only of a breakdown in our education system, but at the basic building block of society. Historically, these intangible skills are learned in the home. While Burstein correctly points out the lack in such skills, she is errant in thinking that Common Core will resolve this dilemma. It will not, and in fact will only exacerbate the existing problems in the education system. While the technical skill gap reflects a failure in schools, the intangible skill gap reflects a larger failure in homes. Critical thinking is not learned solely from reading literature—although that can help—but is also gained from managing complex situations with varying levels of risk. You don’t learn that on a smartphone or a video game. A wise engineering professor once said, “You don’t really start learning until you encounter a problem that you cannot solve.” He was spot-on: when you have to dig outside your body of knowledge to arrive at an answer, then you begin to really learn. This isn’t merely about engineering, it’s about life. In childhood and adolescence, one must learn the rigorous subjects: addition and subtraction, multiplication tables, algebra, grammar, spelling, punctuation, and even chemistry and physics. That necessary body of learning also includes playing team sports, doing odd jobs, learning to prioritize, and working with people. In the process, one learns the complexities of decision-making, as well as responsibility and accountability. Just as you begin learning when you encounter a problem you cannot solve, you also begin learning when you fail. In homes and schools alike, students often aren’t allowed to fail; this deprives them of a very hard reality of life, as failure is an opportunity to learn risk management and responsibility, not to mention integrity. While schools—to include colleges—can help on these fronts, these are the intangibles that children and teens need to learn at home. The workforce is, and has always been, fickle and demanding. Employers need workers who will show up on time and ready to contribute, who have interpersonal skills, who can work with a team to solve problems, who will put in the extra time when that becomes necessary, who will take prudent risks and accept responsibility. This is where Elmore, sadly, begins to break down: while love, honesty, and empathy sound wonderful, they are hardly universal for all people. The Auca Indians of Ecuador, for example, were legendary for their savagery: they killed others—and even themselves—for any or no reason. The first Christian missionaries—among whom were Jim Elliot and Nate Saint—died at the hands of the Aucas in 1956. Thankfully, Christians continued to reach out to them and, today, the once-murderous Aucas are largely Christian. Nor is “love”–even when accepted in a society—understood the same way in all cultures. The ancient Greeks engaged in pederasty—sexual relations between adult males and boys. In the Middle East, “child brides” are not uncommon. While Elmore is correct in that we need a plumb line, he incorrectly posits that we can derive it from universal cultural norms. While American society once had an objective plumb line, we have, over the years, buried it as we collectively exchanged the truth of God for the fleeting pleasures of a moral relativism that is giving way to an insidious Nihilism that is evidenced—at the margins—by suicides and mass shootings. Unfortunately, Christians have created some of the problem here, as Christians often make the mistake of presenting their faith in terms of morality rather than core principles rooted in the person and character of God. On one extreme, Christianity is all rule-based, performance-based morality that leads to frustration as we fall short of the glory; on the other extreme, we have a morality is disengaged from the world and resembles Islamic fatalism rather than proclamations of a loving God who made everything in His wisdom and His time and His goodness, and Who reaches out to a fallen Humanity. Other Christians, adding insult to injury, have not only bought into relative morality, they also promote it within the church, further muddying the waters: they present lies packaged as truth. While Elmore was spot-on in his assessment of our young generation, his recommended treatment is short of the glory. That God sent His Son–who took time to chat with a Samaritan woman, call out tax collectors and “sinners”, heal people who were otherwise outcasts, work tirelessly in training and teaching twelve men who would turn the world upside down without firing a shot–into the world, provides a basis for the compassion of Christian morality. May our nation rediscover that the Lord is good, and His ways are the paths of life. Americans of all political stripes are coming to grips with the disastrous potential of a militarized police force.After all, militarized police forces were the hallmark of Cold War-era Totalitarian regimes. In such governments, the police had all the power, and individual rights were nonexistent. Dissenters often mysteriously “disappeared”, or died under suspicious circumstances. From the old Soviet Union to China to North Korea and Cambodia and Cuba and El Salvador and Chile, militarized police have struck fear into the hearts of civilians. While Americans are right to be concerned about this expansion of the Police State–given that, as government expands, freedom often contracts–we must also consider the realities that have driven this increased militarization of police. Those truths reflect a society at a crossroads. A little over a week ago, a police officer in Ferguson, Missouri–a suburb of St. Louis–shot and killed 18-year-old Michael Brown. One account–refuted by the autopsy–had the officer allegedly shooting Brown in the back, while another account had the officer shooting Brown even though he had his hands up, and still–yet another account, captured on video in the immediate aftermath–had the 290-pound Brown charging the officer.While Brown fit the description of a suspect in an armed robbery, the officer who shot him was unaware of that at the time. These kinds of incidents are why we have a justice process. We must establish facts and reconcile them with the law. Make no mistake: the rule of law is more important than mobs and sound bites. After all, we are a nation founded on the rule of common law, which has its origins in the Old and New Testament. Moreover, our Constitution–in two different places, the Fifth and Fourteenth Amendments–specifies that no person shall be deprived of life, liberty or property without Due Process of the Law.Sadly, the Michael Brown shooting has sparked a number of riots that led to the looting and destruction of businesses and property, with some bloggers trying to justify them. While people are right to demand transparency and accountability in their government, we must resist the temptation to cave to the knee-jerk reactions that foment mob rule. Others have used the occasion to threaten “purges” in other cities such as Louisville. Anyone who defers to mob rule over the justice process, is begging for more government and crying out for the very militarized police that breeds more police brutality. Police militarization is barely more than 40 years old. Darryl Gates, the former LAPD chief, pioneered the use of Special Weapons And Tactics (SWAT) teams, intended for situations where criminals were of sufficient violence and weaponry to require such a response. In his inaugural address, President Reagan said, “Above all, we must realize that no arsenal, or no weapon in the arsenals of man, is so formidable as the will and moral courage of free men and women.“The issue is whether Americans have the character to live as free men and women. Our system of common law and our Constitution were written by people who either were Christians or who were otherwise respective of the Christian consensus in America. While Americans are not without their profound struggles–from the abolition of slavery to the Civil Rights movement–our advancements were reflective ofwho we were. It was the Christian consensus that led to the abolition of slavery. The Civil Rights movement was driven by Christians. The Rev. Dr. Martin Luther King, Jr. won the hearts and minds of Americans through his authoritative proclamations and his commitment to peaceful resistance. He resisted the urge to give in to mob rule, and appealed to the very Christian fabric of Americans in making his case for racial equality. In doing so, Dr. King helped bring about substantive change while defusing a conflict that could have led to a catastrophic race war. This is poignant, because mob rule leads to the bayonet. Disrespect of life, liberty, and property rights also leads to the bayonet. This is because when society embraces evil, this creates a need for more government–including a militarized police force–to contain that evil. A society that does not respect the life, liberty, or property of another person is not worthy of the freedoms for which our Founders pledged life, fortune, and sacred honor. At this rate, the fall of the Republic is a very real possibility. In this last part of series about America’s Key Founding Figures, we will highlight Alexander Hamilton, James Madison, and John Jay—drafters of The Federalist Papers, published between 1787 and 1788 in several New York newspapers persuading voters to ratify the proposed U.S. Constitution. The Papers consisted of 85 essays with Hamilton credited with 52, Madison with 28, and Jay with five. A lawyer and political scientist, Alexander Hamilton, while a student at King’s College, joined the anti-British movement in 1774. He made an impression with public speeches and the writing of two pamphlets containing his revolutionary essays. In 1776, Hamilton organized a volunteer artillery company which led to his assignment as captain of an artillery in the Continental Army. Hamilton’s abilities were noticed by George Washington, and he joined Washington’s staff in 1777 serving four years as Washington’s private secretary. As a New York state legislature, he was chosen as a delegate to the Federal Convention of 1787. Although Hamilton did not agree with much of the content of the proposed Constitution, he was one of three New York delegates to sign it and made substantial contribution to its ratification. Hamilton’s significant role in the writing of the The Federalist Papers played a huge part in convincing New Yorkers to vote in favor of the Constitution. In 1789, Hamiliton was apppointed Secretary of the Treasury and was the primary author of the economic policies of George Washington’s administration. James Madison, an American statesman and political theorist, took great interest in the relationship between the American colonies and Britain. In 1774, Madison took a seat on the local Committee of Safety in Virginia, a patriot pro-revolution group that oversaw the local militia, and joined the Virginia militia in 1775. Madison served in Virginia’s state legislature writing the state constitution and making special contributions to the wording of religious freedoms. In 1780, he represented Virginia as a delegate to the Continental Congress. In 1787, Madison represented Virginia at the Constitution Convention. 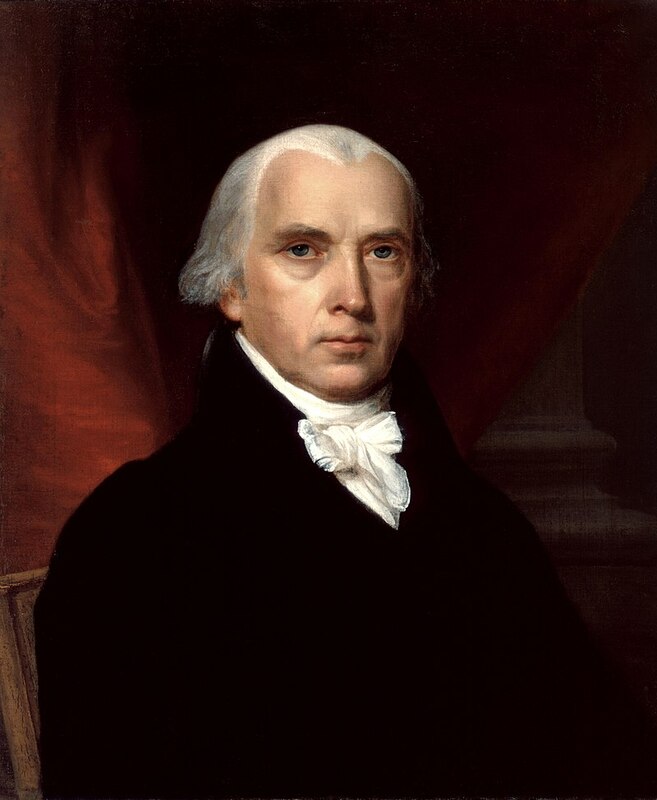 It was Madison’s idea to form a federal government consisting of executive, legislative, and judicial branches, and to have a system of checks and balances. He was also credited with the idea of “shared sovereignty” between state and federal government. His contributions to the Constitution and The Federalist Papers were major in Madison later being dubbed as “Father of the Constitution.” In 1809 Madison became the 4th American president. Biographer Walter Stahr sites John Jay, a successful New York lawyer, as “a vital figure in the founding of our republic,” who devoted himself to the American Revolution. He represented New York at the First Continental Congress in September, 1774. He wanted to keep ties with Britain, but ensuring the rights of the colonists became more important. In October, 1774, Jay’s draft of The Address to the People of Great Britain was adopted by Congress. As New York’s chief justice in 1776, Jay helped write the state constitution. He returned to the Continental Congress in 1778, becoming its president, then took on his most prominent role—diplomat. As Minister to Spain, Jay convinced Spain to loan the U.S. $170,000. He then joined Benjamin Franklin in Paris, France, negotiating an end to the Revolutionary War with the Treaty of Paris (1783). Besides his contribution to The Federalist Papers, Jay authored a pamphlet, “An Address to the People of New York,” which helped ratify the Constitution. He would become the 1st Chief Justice of the supreme Court in 1789. Seven key figures among the Founding Fathers made significant contributions that would affect the lives of the millions who came after them.